In case you’re not aware, children can be taught to meditate. 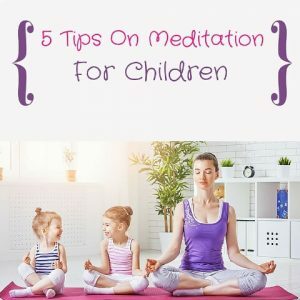 The main thing to keep in mind when it comes to meditation for children is that it needs to be kept simple and fun so that they see it more as a game, than something serious. Almost anyone can teach children to meditate regardless of whether they are a seasoned meditator or not. Here’s three simple tips that any mum, dad, teacher or adult can use to help show their kids how to meditate. Make it a game – We all know that children and adults learn faster and easier when we are engaged and have fun while learning. meditation is no different. If your child thinks that meditation is a chore, or another task to fit in their day, then they’ll most likely kick-back on it. The more you can make meditation a fun activity that they can look forward to the more likely it will be that your child will want to meditate. Help them to go with the flow – Whether you’re using a guided meditation, a movement meditation, or simply helping them to pay attention to their body or breath, try not to put any rules on what happens next. Meditation is best done when it’s left top be organic in nature and then gently reminding them to come back to the focus of the meditation. Everything that happens during the meditation is allowed as part of the meditation journey. Then, we gently help to bring the attention back to the focus of the meditation. Let them discover what meditation means to them – Meditation is a personal journey for everyone. We all have our reasons for wanting to learn to meditate, and that’ll be no different when it comes to why you want your child to meditate. However, don’t make their meditation about your needs, instead make it about what it can mean to them. If they discover that meditation helps them to feel more relaxed and sleep better, then that’s what it means to them. If it means that they feel lighter, then that’s what it means to them. Whatever their experience is, is what’s true for them. Encourage them to use their imagination – Visualizations are a great tool for meditation and encouraging your child to use their imagination to create a safe, peaceful, and fun space while meditating is always a good thing. This might mean that you also need to tap into your imagination as well so that you can reach them at their level without any judgment or limitations. Walk the talk alongside them – If you’re going to teach kids how to meditate, then it will help if you are learning to meditate at the same time. Not only will this help to give you a solid foundation to work from, it’ll also help you to connect with your child from a more practical level of experiential learning. Teaching meditation to kids has many benefits for both the person teaching and the kids. The person teaching gets to engage children in something that is simple, free, and will bring them a lifetime of happiness if they take a shine to it. Whereas the kids get to play, have fun, and discover a new way to relate to their mind, body and feelings.